Schlock-Wire: Screening Schedules for GONE WITH THE POPE and THE EVIL DEAD From Grindhouse Releasing! – Schlockmania! 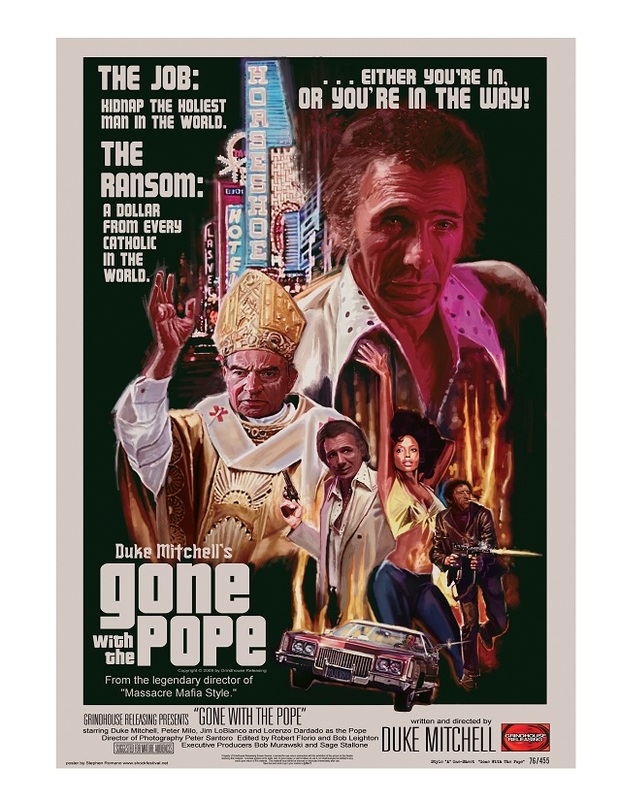 LOS ANGELES – Grindhouse Releasing is proud to announce that Duke Mitchell’s long-lost 1970s crime saga GONE WITH THE POPE will be shown on screens across the country following the film’s successful world premiere in Hollywood. GONE WITH THE POPE was shot in 1975 but remained unfinished at the time of Duke Mitchell’s death in 1981. The film reels sat in his son’s garage until Grindhouse Releasing owners Sage Stallone and Bob Murawski offered to take a shot at piecing the movie together. Murawski took charge of the restoration and spent 15 years giving Mitchell’s low-budget movie an A-list treatment in between editing Sam Raimi’s SPIDER MAN 1, 2 & 3, DRAG ME TO HELL, and THE HURT LOCKER. Murawski and wife/partner Chris Innis won Best Film Editing Oscars for their work on THE HURT LOCKER the same week that GONE WITH THE POPE premiered at the Egyptian Theatre in Hollywood. The buzz from the film’s debut caught the interest of Landmark Theatres, which has been working with Grindhouse on the revival of Sam Raimi’s EVIL DEAD. GONE WITH THE POPE is scheduled to open on Landmark screens in New York City, Chicago, Detroit, St. Louis, Minneapolis, Houston, Dallas, and Washington, D.C.
Murawski will travel to Copenhagen to introduce GONE WITH THE POPE at the CPH PIX Film Festival this month. He will also attend a festival screening at George Eastman House International Museum of Photography and Film in May. Meanwhile, Grindhouse Releasing reports success with its ongoing North American tour featuring Sam Raimi’s EVIL DEAD. 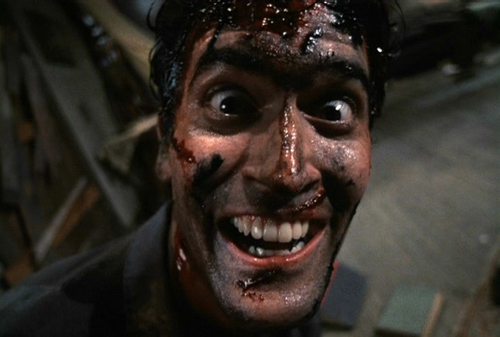 The horror classic will screen April 3 at the Alamo Drafthouse in WInchester, Va., and April 10 at the Alamo Drafthouse Westlakes in San Antonio, Tx., on a triple bill with EVIL DEAD 2 and ARMY OF DARKNESS. For more information and updates, visit www.GrindhouseReleasing.com and www.GoneWithThePope.com. For press, stills, and bookings, e-mail David Szulkin at info@grindhousereleasing.com. May 21 & 22 – E Street Cinema, Washington, D.C.
September 10 – 11 – MIDWAY DRIVE-IN, Dixon, Ill., with S.F. Brownrigg’s SCUM OF THE EARTH and more! Owned by actor/director Sage Stallone and Academy Award-winning film editor Bob Murawski, Grindhouse Releasing has restored such notorious exploitation-horror films as CANNIBAL HOLOCAUST, CANNIBAL FEROX (a.k.a. MAKE THEM DIE SLOWLY), Lucio Fulci’s THE BEYOND and CAT IN THE BRAIN, PIECES, and I DRINK YOUR BLOOD. Renowned for its commitment to excellence, the company has been called the Criterion of cult movies (Film-Talk.com). In addition to its DVD releases, Grindhouse distributes its films in theaters. Grindhouse Releasing partnered with Quentin Tarantino’s Rolling Thunder to release THE BEYOND in theaters and in 2010 launched a nationwide re-release of Sam Raimi’s EVIL DEAD.